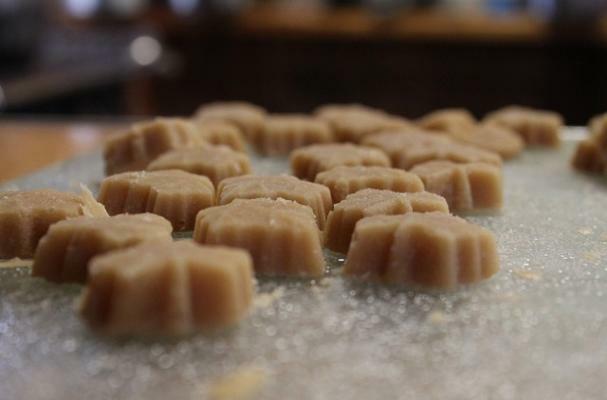 If you are looking for an edible gift to give this holiday season, these maple candies are just the ticket. They one require one ingredient- yes you read right, just one, good quality maple syrup. To make this simple candy, you will boil the syrup until it turns opaque and then either pour it into candy molds or a sheet pan lined with parchment paper. Wrap up these maple candies in a cellophane bag with a bow and you're done. In a deep heavy-bottomed saucepan, bring the maple syrup to a boil over medium heat stirring occasionally (don't be alarmed if you see foam). Boil until syrup until it reaches 238 degrees F on a candy thermometer. Remove immediately from heat and cool to 175 degrees F without stirring, about 5-10 minutes. Stir mixture rapidly with a wooden spoon until the color turns lighter in color, similar to caramel. When this begins to happen, quickly pour into lightly greased candy molds or a pan lined with parchment paper. The mixture becomes very thick very quickly so you need to move fast. If using a pan, cut candy into squares while the syrup is still soft. Wow, how easy! Let me tweet about it. I'm actually looking for a good brand of maple candies/caramels for my store. Any idea?